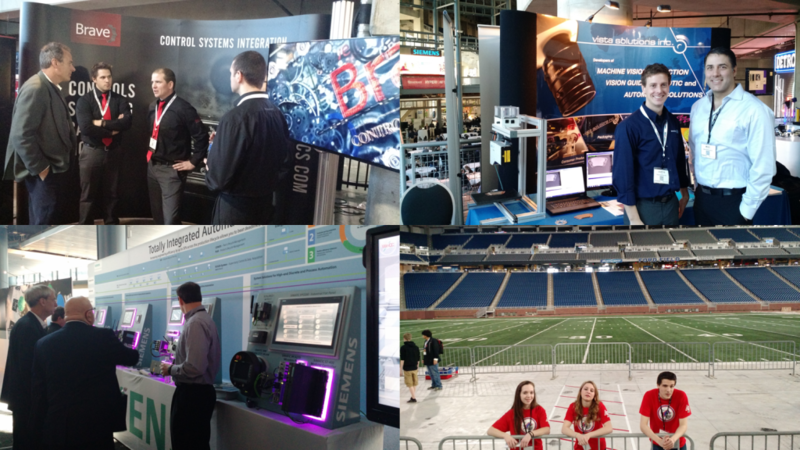 Windsor left a significant footprint at Ford Field with local companies Brave Controls and Vista Solutions representing the best of Rose City innovation. The Holy Names High School FIRST Robotics Team 4940—Knight Vision—was also one of four teams invited by Siemens to demonstrate their robots right on the 40 yard line. Siemens is definitely driving innovation, community and collaboration in the Windsor-Detroit region through this marquee manufacturing symposium and through it’s Gold Sponsorship of the Windsor-Essex Great Lakes Regional FIRST Robotics competition that will draw 50 teams and 1500 high school students from across North America to the University of Windsor – April 3-4, 2015. Admission is open to the public and free of charge. Let’s keep moving the innovation agenda forward in our region!